Subject: Capturing the four main elements of landscape: trees, rocks, water and skies, using simple acrylic techniques. Do problems capturing one or more of the main landscape elements result in your paintings turning out less successful than they could be? After focusing on each of the four main elements individually: trees, rocks, water and skies, students will be more satisfied with their efforts. 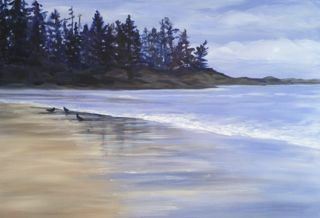 The years Barb has spent painting landscapes, has given her an appreciation of the difficulties involved in capturing their main elements - trees, rocks, water and skies. She enjoys sharing the fun and uncomplicated painting methods she has developed with others.